Phone-Rush: Sony Ericsson Selling Directly...at Fry's? Sony Ericsson Selling Directly...at Fry's? I was in Fry's yesterday (the mecca of all geeks in the U.S.) and as I was passing by a few aisles, a Sony Ericsson K550i caught my attention. 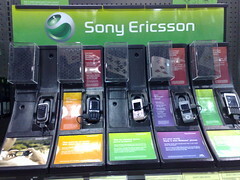 As I went closer, I noticed there is a sub-section devoted to Sony Ericsson handsets, ranging from the low-end Z310a to the P1i. The prices they had there were sim-free prices, but the point is that these phones were unlocked and that Sony Ericsson, even as an experiment at least, is trying to bypass carriers and reach its market directly. The other point is that the customers shopping in Fry's and also the sales associates are usually more technical-orientated than other electronic stores, so they'll be more interested checking out the features of these phones. This is something that Nokia needs to pay attention to if they want to continue their efforts in finding a market here in the U.S. with their high-end smartphones. no kidding huh? if SE can do it then why can't Nokia?